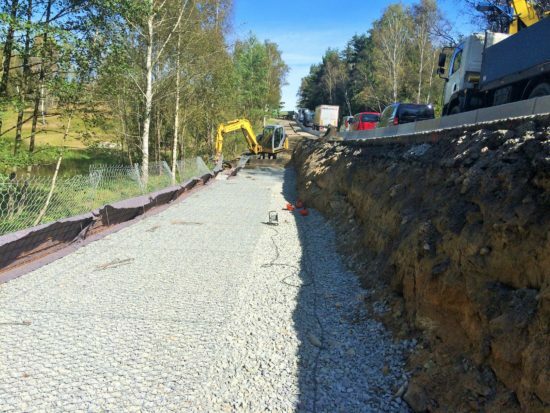 Maccaferri delivered its slope reinforcement solution Green Terramesh® for a project aiming to increase safety on road I/3 Nažidla. The project involved the reconstruction of the road for a total length of 242 m.
The operations to increase user safety on the I/3 Nažidla road, involved the reconstruction of the road between km points 145,520 and 145,762 (including the reconstruction of the unpaved shoulder in a 1.5m standard width) by the use of prefabricated elements (soil reinforced structure) and gabion structure. The total length of the road reconstruction is 242 m, split between the left and right sides of the road; the reinforced soil slope is 142 m on the right side and 62 m on the left side. Green Terramesh prefabricated elements were used for the soil reinforcement and featured a 60° face inclination. Green Terramesh® is a prefabricated unit made of steel double twisted wire mesh (8×10 type) coated with GalMac® galvanising with an additional polymer coating. It also includes an erosion control blanket at the face which is stiffened with a welded mesh panel. The face is retained at the correct face angle during back-filling by the inclusion of two pre-formed steel braces and ties. All components are factory-fitted within the unit dramatically reducing the construction time on site. The soil reinforcement element is made from a continuous panel of our steel double twisted wire mesh and it serves as the horizontal soil reinforcement (with a length of 3 m), the face mesh and the upper horizontal return. GalMac® and polymer coating of the steel wire ensures a 120-year lifetime of the construction according to the standard ČSN EN12223-3. Green Terramesh® is delivered on the job site as folded units ready for deployment into the works. Units are erected, placed and then simply connected to each other by C rings. Suitable soil backfill is then placed upon the geogrid panels and compacted. Further layers of soil are placed and compacted until the full height of the unit is reached. Subsequent courses of Green Terramesh units are then placed, creating the full soil reinforced structure after the completion of backfill.